I’m a huge fan of the Instapaper service for saving Web articles for later reading, sans ads and messy formatting and layout. It’s great when you don’t have time to read a longer article immediately, or when you want to save an article you found on your iPhone so you can later read it on your Mac or iPad’s larger screen. Read It Later is a similar popular service. Both are also useful for archiving interesting articles for later browsing or sharing. But for both services, the best experience for reading your saved articles has been found in iOS apps—specifically, when using the official Instapaper or Read It Later app on an iPad. When sitting at your Mac, you’ve been limited to reading saved articles via the Instapaper or Read It Later website in your browser. Though each site lets you browse and view the reformatted versions of your saved articles, the experience just isn't as nice as with native app. In addition, neither site offers as many features as its app, with the biggest omissions being the capability to download articles for offline viewing and to search the text of saved articles. Fortunately, both services offer an application-programming interface (API) that lets other developers create apps that work with the services. (You can get more information about Instapaper’s API and Read It Later’s API.) Which means it was only a matter of time before we’d see Mac apps that aim to make the desktop reading experience more similar to that of the aforementioned iOS apps. 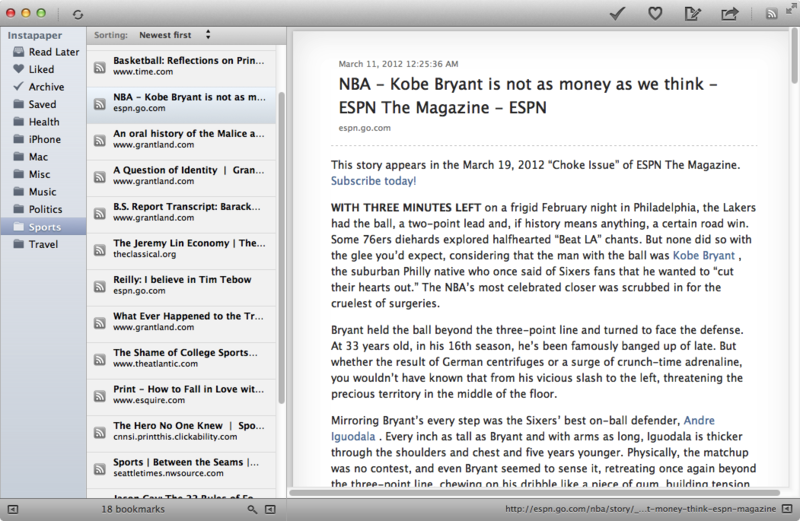 Read Later 2.0.3 (Mac App Store link) is one of the first, and it works with both Instapaper and Read It Later. Click a folder or tag, or your main read-later queue, and you see a list of the saved articles it contains. Click an article, and it’s displayed—sans ads and messy layout, for easier reading—in the pane to the right. A full-screen mode lets you read without distractions, and you can even toggle the visibility of the folder and article lists, leaving nothing but the selected article. You can sort the selected article list by date, title, URL, or (for Read It Later) tag; you can also choose whether to display or hide dates and previews in the article list, and you can change the article font, font size, line height, and width to suit your tastes. The program also offers four themes that determine the article background, text color, and layout while reading; one of those is a user-submitted theme that has some layout issues, but includes a nifty drawer for quickly viewing all links and images in the current article. While browsing articles, you can search article titles, URLs, and (for Instapaper) folders or (for Read It Later) tags, but not article bodies. You can also edit a particular article’s URL, title, and (for Read It Later) tags; unfortunately, doing so changes the date of the article within Read Later. You can move an article to a folder (for Instapaper) or assign it a tag (for ReadItLater) by simply dragging it from the article list to the desired folder or tag, respectively, on the left. (You can manage—add or delete—Instapaper folders from within Read Later, but not ReadItLater tags.) Any article-management tasks you perform while offline will sync back to the server(s) the next time you have an Internet connection. Read Later also provides a slew of options for what to do with an article’s URL. You can copy the URL, open it in Safari, open it on the respective service’s own site, or archive it, email it, or shorten it for pasting elsewhere. You can also share the selected article on Twitter or Facebook, or save it to your Pinboard, Delicious, or Evernote account. For Instapaper accounts, you can also Like articles. Read Later also makes it easy to get new articles directly into the program: You can drag URLs onto the Read Later icon or into the main window, or you can use custom keyboard shortcuts to add a URL from the clipboard or from the current browser page. If you’re a fan of trackpad gestures, you can configure a number of gestures for viewing and navigating articles. On the other hand, apart from keyboard shortcuts for some of its menu commands, Read Later offers little keyboard navigation—you can’t use the arrow keys, Tab, or other keys to move between folders and articles, or to browse your article list. Overall, Read Later works well, though I did find that while the program successfully downloaded over 1,000 articles each from my test Instapaper and ReadItLater accounts, it didn’t always grab all images for offline viewing. However, if I was online when viewing an article with a missing image, Read Later would generally be able to download the image at that time. Another issue I occasionally ran into: Read Later would display an error that Instapaper “was not able to fetch or parse the article and therefore can’t display it,” yet the Instapaper website and iOS app displayed that article in full. Though I still prefer reading saved articles on my iPad, when sitting at my Mac, Read Later offers more features than the Instapaper and ReadItLater websites, as well as a nicer reading environment. And it lets you download your articles for offline viewing, which is convenient if you’re traveling with your MacBook, but not your iPad.